It is that time of year. Flowers are in full bloom, the birds and bees are busily flitting from blossom to blossom pollinating away, and we humans are suffering with the sneezing, runny noses, and itchy and watery eyes that come along with seasonal allergies. You may have noticed that about this time of year, your dog seems to get very itchy, almost to the point of scratching his skin off. 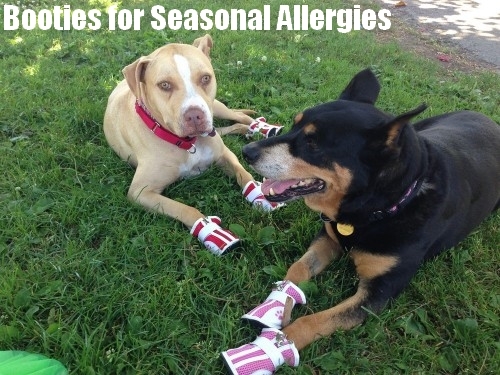 Perhaps your pup is suffering from allergies too. Seasonal allergies are very common in our four-legged friends. Our dogs are susceptible to the same kinds of allergies we humans are, and they suffer just as much. Seasonal allergies can broadside a dog that has been clean and clear-eyed for months. Suddenly she seems to be constantly scratching, biting her fur, chewing on her feet and scrubbing her eyes and face against the carpet. Something has bloomed, and her immune system has mounted a huge offense. You may be reacting to the same allergen with different symptoms, and you’re just as miserable as your dog. If these are new symptoms for your dog, have your vet check her over to see if there is something going on besides hay fever. Continuous scratching can lead to broken skin and skin infections. Ears and eyes can also become infected as a result of allergic reactions. If you understand how allergies work, the signs and symptoms of allergies in your pet, and things you can do to help your dog when allergies strike, you and your pup will be able to make it through the season with minimal discomfort. Seasonal allergies work in dogs a lot like they do in humans. When a dog is exposed to an allergen for the first time, there will be no visible response to the allergen, but their immune system goes to work producing antibodies to the allergen. The second time your dog is exposed to the allergen, those antibodies that were created during the first exposure go to work fighting off the allergen and cause an allergic reaction. Each time your put is exposed to the allergen, their immune system fights harder and harder against the allergen causing a bigger allergic reaction each exposure. Now that you know how seasonal allergies in your pet work, it is important to understand the signs and symptoms in your dog. When humans have an allergic reaction to pollen or other allergens, we usually experience respiratory symptoms like sneezing, coughing, runny noses and itchy and watery eyes. 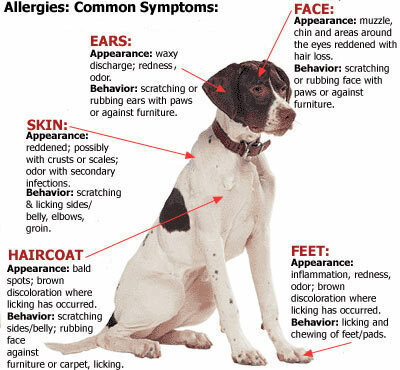 However, dog’s symptoms to the allergens are very different. While a small minority of dogs might exhibit respiratory symptoms, most dogs will have itching, also known as allergic atopy. Dogs affected will itch and scratch all over their bodies, even to the point of creating bald spots, bleeding, and infection. The best way to prevent seasonal allergies in your dog is to eliminate the allergens from the environment. Start by shampooing your dog frequently. Washing off the allergens will help keep the dog from suffering with allergy symptoms. Second, take off your shoes when you come in the house so you are not tracking the allergens into the home. You can wash your dog’s feet to prevent them from tracking allergens into the home, or outside. You can save yourself the trouble of washing your dog’s feet every time she goes outside and comes back in by teaching her to wear boots outdoors. Canine footwear comes in a variety of styles and materials and can protect your dog’s feet from more than just allergens. Dog boots will protect their paws from the grass, weeds and other irritants and then you can remove them when the dog comes in the house instead of having to wash their paws every time they enter your home. Finally, you can keep the environment clean by vacuuming and dusting regularly. This will remove allergens that find their way in and keep them from bothering your canine companion. If you find that eliminating seasonal allergens from your dog’s environment is not helping, be sure to talk to your vet. Your vet can recommend allergy medicines to help relieve the discomfort your dog is experiencing as a seasonal allergy sufferer. 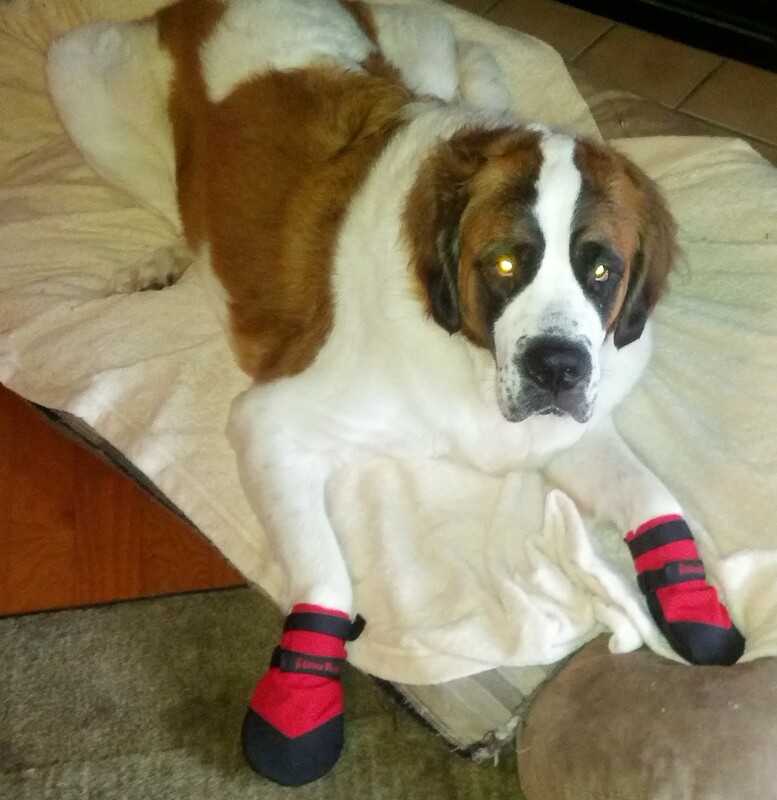 "This is a photo of my St. Bernard Karma, sporting her new red boots! I purchased the boots because she has serious allergies to...well, just about everything, apparently. She has been licking her 2 front paws to the point of driving me bonkers! It was especially bad after we would go outside. She was getting to the point that she hated to put her paws in the grass. The issue seemed mainly to be with her front paws though, not her back. As a last resort I thought of boots to keep the pollen and allergens off of her feet. When I first put them on I thought I would be sending them back the next day. She seemed paralyzed and refused to move. Thankfully, I can usually count on her stomach to make her do things her brain would not do so I got the treat bag. By lunch time she was not only walking around inside, she went outside and walked right in the grass to do "her thing". Within 24 hrs. her paw licking was down by about 90%. She knows that she has to put her boots on every time she goes outside and waits patiently at the door while I do just that. Now, I know the grass is not the only allergy she has and I know her paws still itch to some extent and occasionally she will like one for a few minutes, but there is not doubt in my mind that either the grass or the chemicals, the lawn management team in my townhouse complex, uses on the grass were contributing factors to her constant irritation. 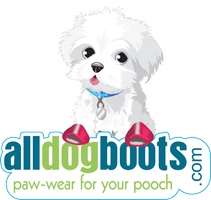 While researching boots I did not come across one other person that had tried boots for allergic dogs, so if you are thinking about it... for Karma and myself, they work!" Take a look at our Meshies by Barko Booties to prevent seasonal allergies. Extreme symptoms might call for more drastic steps. There are many medications out there that can help your dog with seasonal allergies. You may want to ask your vet about Atopica, Apoquel or even dog allergy shots (Cytopoint). Your vet can help you sort through the possibilities. Many of the same treatments can be applied to other types of allergic reactions, but if the verdict is seasonal allergies, you can save wear and tear on your nerves and wallet by not going through the process of testing one allergen at a time to learn exactly what causes your dog’s allergies. If you can remove some of the most common offenders like ragweed from your yard, it might help some. That pollen can still be carried into your pet’s vicinity by wind and on shoes and clothing, so you might notice only a slight decrease in symptoms. One sure way to give your dog some relief is to keep her clean. Frequent cool baths with a mild dog shampoo will wash off the allergens and reduce itching. Don’t ignore her feet when bathing. Allergens and dirt collect between the toes and continue to aggravate if the bath isn’t thorough enough. Daily foot baths can help on days when a full bath isn’t needed. You can save yourself the trouble of washing your dog’s feet every time she goes outside and comes back in by teaching her to wear boots outdoors. Canine footwear comes in a variety of styles and materials and can protect your dog’s feet from more than just allergens. Another thing that can help is clean bedding. Having an extra dog blanket or two on hand so that you can rotate and wash them frequently will make that job less trouble. Running the vacuum cleaner more frequently during allergy season can reduce the allergens in the house and make everyone more comfortable. Remember that the end of summer can also mean an end to the discomfort for your dog and the extra work for you. Don’t forget, though, that spring and summer will come again, and you might want to stock up on antihistamines, soothing dog shampoos, and doggie booties at the same time you’re buying extra boxes of tissues for yourself. A dog with seasonal allergies isn’t exactly low maintenance, but maintenance means spending more time with your buddy and making sure she’s comfortable. After all, that’s what having a dog is about.